Niobe, daughter of Tantalus and wife of King Amphion of Thebes, gave birth to seven sons and seven daughters. At the annual celebration in honour of Leto, goddess of motherhood and protector of the young, Niobe boasts that she is greater than the goddess by virtue of the fact that Leto only has two children, Apollo and Artemis, whereas she has seven times as many. Leto, enraged, sends Apollo to kill all her sons and Artemis to kill all her daughters. Her husband Amphion, devastated, kills himself. Niobe is turned to stone on Mount Sipylus and, as she weeps ceaselessly, waters cascade down her rock face. I discussed with Tamsin Waley-Cohen the plight of women in our own time who, under Sharia and other religious laws, are cruelly and harshly punished for offences of blasphemy, apostasy and non-conformity. Our subsequent discussions included the double standards also applied to Western women and how Niobe’s story mirrors the plight of unfairly treated women in a wider context. These four pillars support an extended, reverse sonata-form structure. Within that framework I have tried to portray in music Niobe’s sensuality, feistiness, pride, arrogance, remorse, defiance as the story of her blasphemy against the goddess Leto and her extraordinarily harsh consequent punishment unfolds. The relationship of the violin soloist to the orchestra is inspired by the dramatic unfolding of the myth: the sensual love music for Niobe and her husband King Amphion; her virtuoso musical ambush of the goddess Leto’s ceremonial music; her devastation at the murder of her fourteen children; her transformation into a rock with tears that will flow for eternity. At times the soloist leads the orchestral texture, whipping it into a frenzy, at others it is brutally bullied by the orchestra, literally hounded like the cello soloist in Lutosławski’s Cello Concerto. In discovering that sonata form could embrace the entire span of the work I thought about how the two principle themes of the exposition, those of Niobe and Amphion, could be recapitulated. After many developments and transformations of the Niobe theme in the first, second and third movements the point at which Amphion dies of a broken heart, as he contemplates the bodies of all his murdered children, forms a climactic return of his theme that had started so full of promise and confidence. The dying away of his theme leads to the fourth movement, in which the Niobe theme returns in a slow mournful, descending version, like her tears. I thought for a long time about how to make the final movement, which is the only proper slow movement of the work, emotionally climactic but still, timeless, petrified. An interlude in which the violin slowly descends over arpeggiando multi-divided strings and pianissimo brass countermelody almost evokes beauty in Niobe’s tragic transformation. But, like an insect struggling in the last seconds of its life to escape the amber that will encase it for millennia, the violin flails and struggles as the murmuring orchestra overpowers it in the final bar. Along with the sonata structure I make extensive use of motivic transformation and development. Even the first thirty-six bars, the exposition of Niobe’s theme as an extended cantilena, see the theme augmented, diminished and its intervals varied. The intervals undergo their greatest alteration in the second movement and at the end of the fourth, where the song-like contour of the theme is stretched to leaping intervals that cover the violin’s widest range. Each movement incorporates the same opening chord sequence, which is made up of six-part woodwind chords based on major and minor thirds—the prevalent intervals of Niobe’s theme. Their recall in different guises (brass fanfares in non-retrogradable rhythms in the second movement, stabbing wind and brass chords in the third, muted string chords punctuated by soft wind in the fourth) give them the function of ritornelli, their presence tying the musical material down implacably as Niobe moves inexorably towards her tragic destiny. The four movements each move towards climaxes that define key elements of the story: the climax of the first movement builds from the combination of Niobe and Amphion’s themes in a sort of love duet to the point of sexual climax; the second movement’s climax is the point at which, at the height of her musical ambush of Leto’s theme, Niobe trumps Leto’s theme with her own; the third movement’s is the point at which, confronted by the murder of his fourteen children, Amphion’s heart breaks; the fourth is the final bars of the work in which Niobe struggles to break free from the orchestral barrage that petrifies her for eternity. Niobe’s father, according to the myth, was King of Phyrgia, so I built much of the material on the Phyrgian mode. Despite extensive use of Phyrgian, Locrian, whole-tone and pentatonic scales the harmonic language of Niobe is chromatic. Clear tonal centres are defined but harmony is often used non-functionally, being made up instead of predominating intervals (the major and minor third for Niobe, the perfect fourth for Amphion, the tritone and descending sixths for Leto). 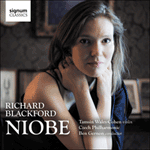 Regardless of whether the listener is even aware of Niobe’s tragic story, let alone the progression of the four movements of this musical portrait, I hope that the passion, drama and conflict of the story will nonetheless be perceived as a taut musical structure in its own right. I am indebted to Tamsin Waley-Cohen for her encouragement and support as we developed the concept for Niobe and her brilliance as a soloist and interpreter of my music.